Education is a central feature of our lives. Collectively, our society invests billions of dollars in schools and colleges, with the hope that they act as transformative institutions that create a society of educated and productive citizens. But what if education doesn’t deliver on its promises? What if our educational institutions are poorly suited to the tasks we demand of them? 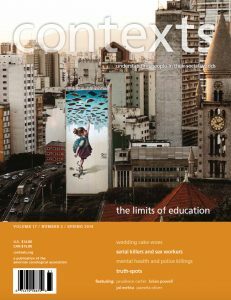 In this issue, Prudence Carter explores how schooling might be mobilized in a world of relatively rigid racial and economic inequality. Karl Alexander, who has worked for decades in the sociology of education, discusses his involvement in Baltimore school reform efforts, including racial integration. Our back page piece, by Jal Mehta and Scott Davies, asks whether sociologists, in their concern about inequality, have neglected the institutional and political effects of education. And Jennifer Randles looks at a different kind of education: government funded programs aimed to “teach” men to be responsible fathers, and through which many of those fathers earn GEDs that help them access better jobs.